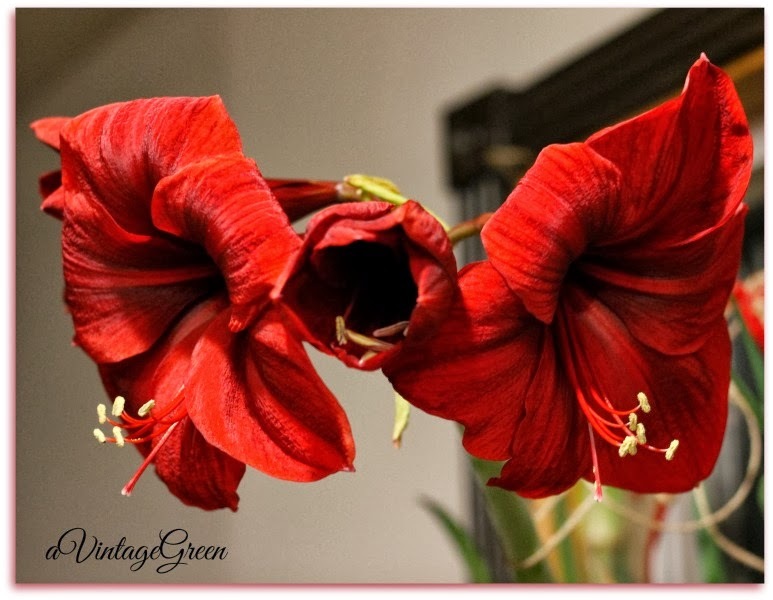 New Year, first post, red amaryllis. 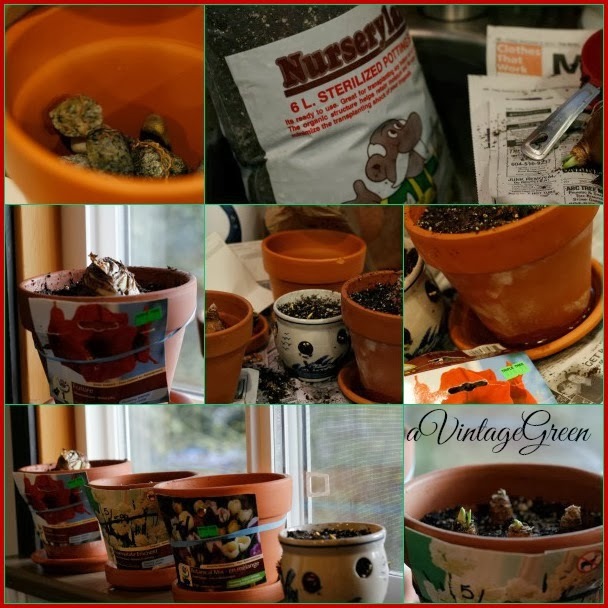 DGS and I went shopping for bulbs in November, bought some fresh potting soil. Headed out to the shed for pots and gathered a pile of small rocks from the garden borders. Spread newspaper, scrubbed the pots and washed the rocks. Rocks in first, a bit of soil, settled the various bulbs and added a bit more soil. Watered. Waited. Finally some growth. Watered a lot. Still waiting and then finally, a flower stalk and blossoms. 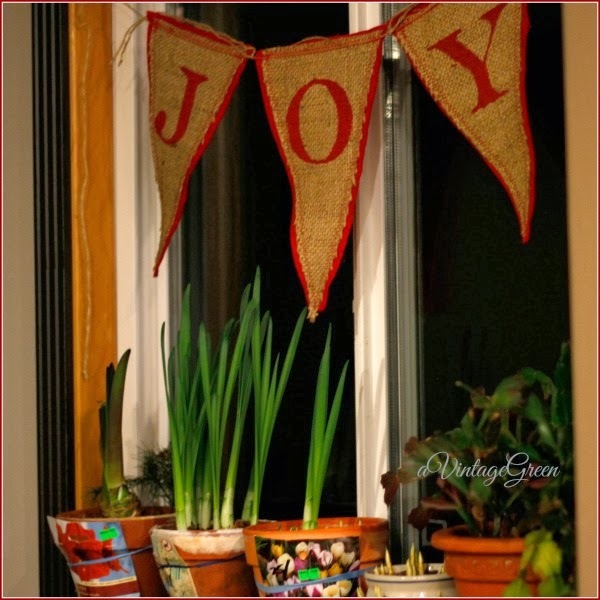 Bulbs dry out quickly, watering is essential, test their soil daily, especially when the heat is shooting up from the register right below the window sill. Gratefully still watering and enjoying. One part of DGS's cub scout badge for gardening. Every fall I tell myself I am going to plant bulbs and every spring I yell at myself for not following through. This year my excuse was our puppy who is still digging up the garden. Love your blooms Joy. I missed planting paper whites this year. Maybe it is not too late. 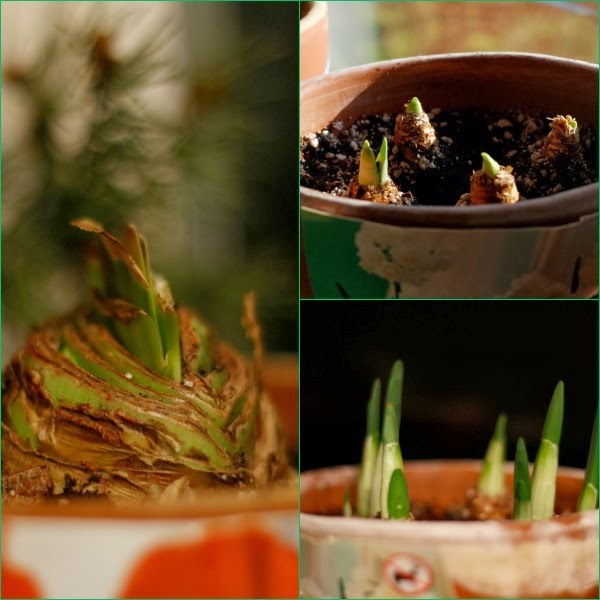 I had a set of three potted amaryllis sent to me from a friend. So far they are just the leaves but I expect a flower soon on one of them. Yours look great- it's fun to have that splash of color in the winter isn't it! My Christmas Cactus is full of blooms and will be flowering soon. I keep these in my window like you! I guess I should take some pictures soon. Thanks for sharing. Visiting from Share Your Cup Thursday. 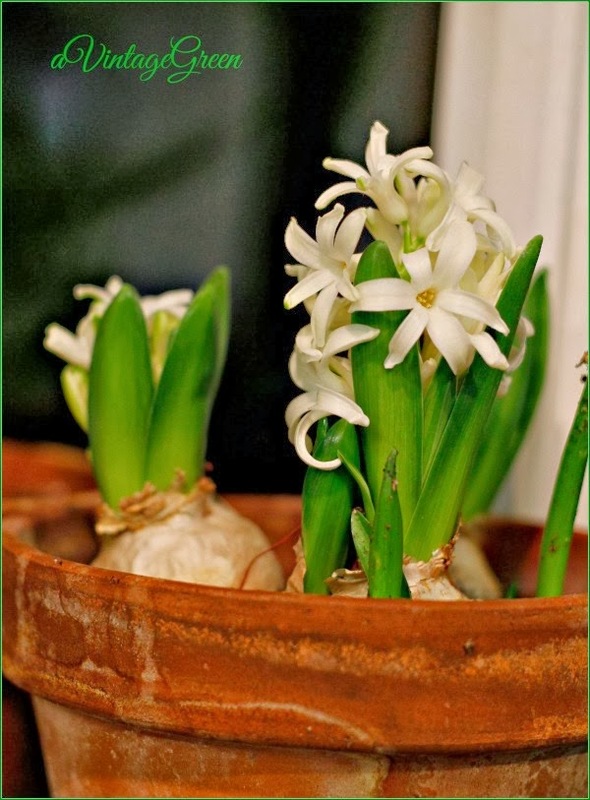 Bulbs are like little jewels in a pot and it's always a surprise when they open. Yours are lovely! Happy New year, Joy! May 2014 be like your name and bring you much JOY. Thank you for sharing at my HOME. 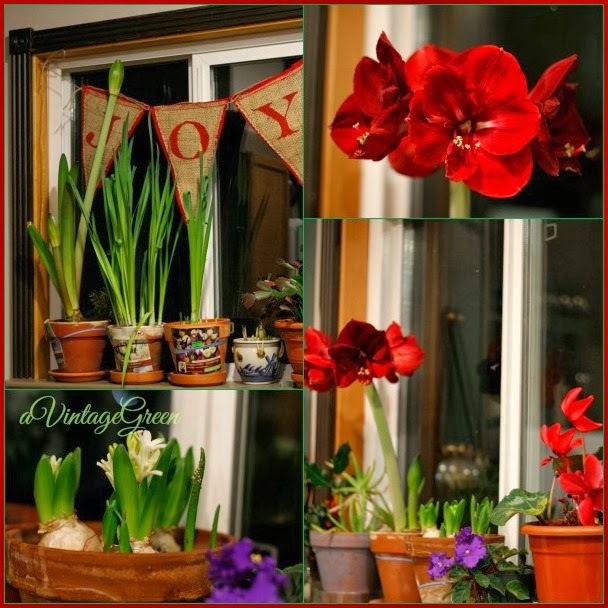 I've got three bulbs with buds coming right now, but my Christmas blooms are long over. The beauty of that amazing amaryllis flower really brightens up my living room when it finally bursts out. Great post for a cold January day! Nothing like beautiful flowers to get us through the cold Winter Joy. My paperwhites and Amaryllis just finished putting on their show. 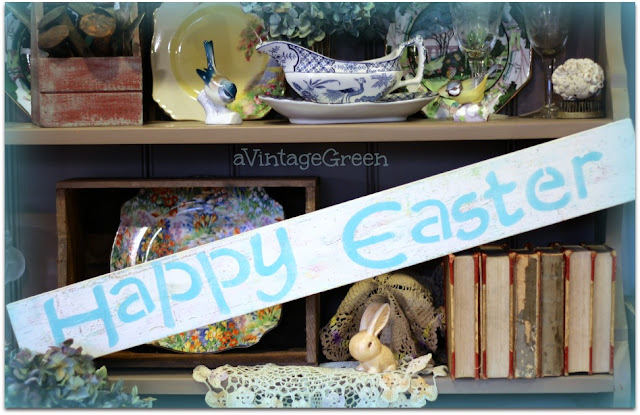 Now I need some Hyacinths! Yours look lovely! Check back tomorrow at our party...you are being featured! Yay!